For this month's "Maps Of The Month" featurette, I wish to draw your attention to Zerker's Xargon (PC) maps. Malvineous Havershim, an archaelogist, finds his way into another world. Apparently, it is a world ruled by an evil being named Xargon, but, hey, Malvineous has the power to defeat him! And so, another computer game adventure ensues. Xargon (the game) is a platforming action game, perhaps not so much different in style than other 1990s shareware games, but is of decent length and quality. Zerker, who has mapped a number of PC games for VGMaps.com, took it upon himself to map this game, but not by the common screenshot-by-screenshot method. Nope, he looked at the game's code, and found a way to render maps based on it. But what really impressed me about Zerker's effort was not just that he mapped this game this way, but that he took the time to teach us all how to do it. In the forums, he has a topic called "PC Game Hacking and Mapping Tutorial: Xargon" where anyone can learn to map like him! 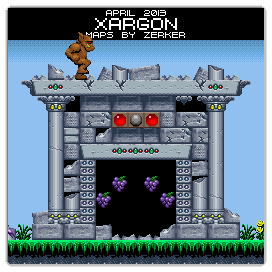 So to acknowledge the effort put into advancing our mapping skills, Zerker's Xargon (PC) maps will be known as VGMaps.com's Maps Of The Month for April 2013. Any particular reason my overworld maps disappeared? I actually put some work into those so they didn't show the abrupt endings that appear in the map data since the player never sees those on screen. While it's true that any player wouldn't normally see some areas of the maps, in the cases here I don't think it's confusing or unwieldy to show the full map area, especially for consistency's sake since that's how he mapped the rest of the game. Because of Zerker's method of mapping (and in the forums he demonstrates that), it's obvious to me that he mapped it independently, and is not merely appending to your maps, which is a concern I have when having to choose someone's map to replace another's. I hate having to make judgment calls like this in any case. Here I thought it would be redundant to have both versions, and yet I felt I couldn't reject his when he mapped the game so thoroughly. Though if Zerker hadn't made the topic that he had where he taught how to hack/disassemble the game, by virtue of your maps being first, they would have had a better chance of staying. Though I still have copies of your maps if you really feel that I should put them back. Question is, what would I call them? The concern of redundancy from two (or more?) mappers has been raised a few other times, including recently. When choosing which maps to feature and which to replace, it seems like a case-by-case basis, which is why I haven't been able to post some ground rules for how the situations should be handled. I could probably post a number of criteria that influence my decision, but I don't know that it would be like a flowchart that could be easily followed. Regardless, remember it's nothing personal if I pick someone's map over yours. I'd like to think my judgment isn't usually horrible. And if/when your maps get rejected, remember there are still thousands of other games yet to map. There is no shortage of opportunity. Thanks for the map of the Month, Jon! As for the overworld maps, I'm quite happy if you just put DarkWolf's maps up instead. They were quite well done, and I don't need to have the "complete set" . An excellent choice for MOTM. Jill of the Jungle is pretty much a predecessor to this game. Absolutely rich in colour, crispy in detail and lots of atmosphere in caves, forests and factories, odd looking monsters and of course Dan Froelich's matching music. The music of "More Giant Trolls" level has an uncanny likeness with minor differences to the music of "Episode 2 - Level 1: Atlantis" of the game "In Search of Dr. Riptide" by the same composer. The disappointing bit about Xargon is a lack of variety in transformation. While Jill could transform into a firebird, frog or fish, Malvenious could only transform into a wasp or ride a submarine. If I didn't know emeralds to buy upgrades was part of the game, I'd say it spoiled the challenge not unlike a cheat code. I have never done graphic game hacking, when I mapped Jill of the Jungle it was done entirely by Printscreen, DosBox and Microsoft Paint and viewing the levels required much looking up and down, moving around and a few cheat codes to aid. Ages ago I only made a sample map of the first level, just to demonstrate the outcome of a level map within this game, but it is long since replaced by a better and more accurate version by Zerker himself. If you really want to finish your collection once and for all, you might wish to map the Demo level, the one where he fights black ants and enters three samples of the trilogy. For the time of this award congratulations Zerker, you've truly earned it. I'm trying to mix things up with the Maps of the Month. Or at least whenever I can. It's easy enough to choose a popular/good-looking/epic game, but that skews things towards the game and not necessarily so much about the mapmaker himself/herself. Or it's easier for anyone to miss the effort when they see the pretty graphics. Not saying that Xargon isn't a good-looking game - it's decent for its time. And not saying Zerker wouldn't have deserved it anyway. But in particular, Zerker's effort to teach us how to map via analysis of code as another option (instead of or in addition to the usual screen capture method) I felt was exemplary. I know some people already use such methods, but it takes patience and dedication to explain it all. Anything that stirs up conversation on the forums is a good thing, but something that teaches us all a little something is awesome! Hence its recognition this month. I was leaning towards putting DarkWolf's maps back, and then when I saw Zerker was gracious enough to support DarkWolf's originals it was then a no-brainer to push my inclinations all the way. So they're back now. Hopefully I'm not seen as the bad guy. Sometimes I just have to make hard choices and my judgment may not always be in line with what the everyone else involved would think. Though I won't apologize for being human and imperfect, I will apologize for particular decisions like this one. Sorry. Are we all cool now? I think this way is the best. Although, I personally would have preferred to see both posted, one being the raw version from the game, and the other an edited and beautified take on it. DarkWolf's versions look so natural it's almost impossible for me to remember how the originals used to look. If you really want to finish your collection once and for all, you might wish to map the Demo level, the one where he fights black ants and enters three samples of the trilogy. For the time of this award congratulations Zerker, you've truly earned it. You can also get the scripts there if you wanted them.